I want to get a regular series going that provides a context for mental health and violence because usually, the context mental health gets these days is violence. Conversations around mental health these days are inextricable from violence. Without violence, the mentally ill are often invisible. The fallout of the recent horrifying shooting in Lafayette, Louisiana is a perfect example. In 2012, Gov. Bobby Jindal announced that the Southeast Louisiana Hospital, also known as SELH, in the midst of celebrating its sixtieth year of serving the people of St. Tammany’s Parish, would be closed due to severe cuts in federal Medicaid assistance. 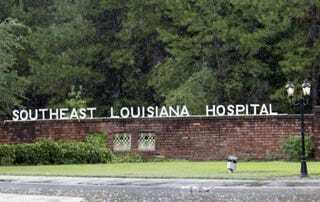 SELH was considered the “jewel” of Louisiana’s generally underperforming mental health system, and had attained a name for itself in 1959 when Gov. Earl Long was forced to run the state’s government from the hospital’s phone, having been committed there against his will by his wife. He later escaped. For the most part though, the hospital grew and improved itself as the decades passed. In 2012, it was catering to over two hundred patients. The Medicaid cuts that would result in the announcement that SELH would close, and its eventual privatization, occurred under complex, murky circumstances. The cuts were part of a massive transportation law, known as the Restore Act, that brought fine money from the BP oil spill back home. Among others things, it brought $100 million dollars for mass transit to Louisiana. Democratic Senator Mary Landrieu called it a “tremendous victory”, Republican Senator David Vitter said it was a “triple win”. The one downside? “To help pay for everything,” noted the New Orleans Times-Picayune, “the law cuts $651 million in federal Medicaid assistance to Louisiana.” Congressional Republicans wanted twice that cut, and also blamed a Landrieu typo from an earlier law that Jindal’s government had already factored into spending. Whatever the reason, nobody lobbying on behalf of any health organizations got a chance to put a word in edgewise: “It just came down so fast that there wasn’t much of a chance to weigh in on it,” said John Matessino, president and CEO of the Louisiana Hospitals Association. The cuts, and specifically the closing of SELH, were met with widespread protests in Louisiana. The New Orleans City Council unanimously passed a resolution asking Gov. Jindal and his Department of Health and Hospitals, DHH, to reconsider. Picket lines were formed. Dogs wore signs saying “I’m more humane than Bobby Jindal”. This was a very public protest, not just on behalf of the over two hundred patients, but as an attempt to draw a line in the sand. “I think we all feel a little battle-worn because we continue to fight this battle (against) the taking of all mental health service in our city. And time and time again we lose this battle,” said New Orleans City Council President Stacy Head. This time they won, kind of! The Jindal Administration backed off its plans to close the hospital in favor of privatization. It’s worth noting Jindal was familiar with the tensions between adequate care and turning a profit. Before his governorship, he had been head of the DHH, where his opponents claimed he would eagerly close clinics to help balance the budget. While many were initially happy that the hospital was going to be saved, the process of privatization would prove to be painful in ways unique to itself. And truly, the track record of Meridian CEO Wes Mason shows he had earned every ounce of that multi-million dollar participation award. Before Meridian, he was CEO of a systematically incompetent hospital in Virginia, and before that he worked for a provider of private psychiatric care which the muckraking ProPublica called “dangerous—and sometimes, deadly” to its clients. So it wasn’t really a surprise when seven months after the private takeover, the one-time jewel of the Louisiana mental health system was getting negative reviews from the federal government saying that the “problems are of such a serious nature as to substantially limit the hospital’s capacity to render adequate care.” Proper records weren’t kept, an employee shoved a patient, and, shockingly, after the layoffs, they needed more staffing. The DHH did a follow-up, vaguely stating that the problems had been corrected, and more importantly another alternative for the mentally ill in St. Tammany’s Parish has opened up. So with any luck, things will get a little smoother there after a rocky couple of years. Louisiana currently ranks 47th among the states in access to mental health care treatment. Bobby Jindal is currently running for president, a position which he has a shitstain’s chance in Hell of getting. He, as well as his attorney general Buddy Caldwell, took the chance after the nightmarish movie theater shootings in Lafayette to speak out, and they were very careful with their words. This was not about gun violence, they said. This was about the need for better mental health care treatment. To an extent that there is a national conversation about mental health, this is it. Held at the barrel of a gun, after all the doctors have been laid off and all the hospitals downsized. Forget the fact that an involuntary treatment program, if it is to be successful (a major if), needs massive investment beyond anything Louisiana is dreaming of offering. Ignore expert after expert after expert could tell you that there is no link between being mentally ill and violence, that the mentally ill are in fact more likely to be victims, and yet the conversation never changes. What matters is violence, and what matters is that out of that violence stems direct, physical control. All of this could just be a niche conversation, of course, if America was not being crushed by silent, gaping need for mental health coverage. Because Louisiana won’t expand Medicaid to include the Affordable Care Act, for example, an estimated 163,000 people there with mental illnesses don’t have health insurance. Nationally, black adults are 20% more likely to report “serious psychological distress” than whites, and in a poll of black adults on the subject of not being treated for their diseases, nearly a third cited the fact that they couldn’t afford treatment. One in four Americans will face a mental illness this year. The battle for the Southeastern Louisiana Hospital is notable because within the state, the effort to save it was loud. It did not fall through the cracks. It went down with a fight, but it went down nonetheless. If having a charming local history and, again, helping over two hundred people with their daily lives, if being the jewel of the system, isn’t determined to be worth saving, then what is? The only language that is heard coherently is violence.